We had some wonderful Reislings when we were in France a while ago, but I tend to like the dry reds...Malbec, Chianti, etc, Your mosaic is wonderful,and I like the addition of the corks. I'm not a wine drinker, but if I could go and get photos like yours, I'd still go! Lovely mosaic! I'd love to visit the wineries in the HIll Country. Something that is on my list! A wonderful mosaic, thank you for sharing your time in wine country. Enjoyed your mosaic! 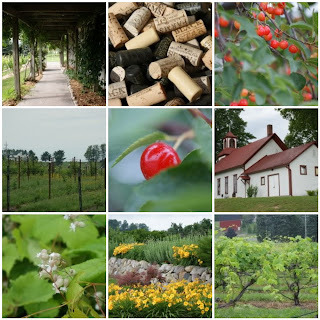 Beautiful wine country shots! I'm with Black Eyed Susan, above. Give me a juicy Malbec and no ice ever, even in a white wine. But hey that is just me. We should drink what we like. Ice? Really? Oh sorry. Love your blog! Thanks for the visit. You have beautiful mosaic. Beautiful mosaic of country side. They are very refreshing. Beautiful photos of the winery. I do not use ice and love the reds. What nice photos you captured on your wine tasting. I happen to be a "light-weight" when it comes to wine and tasting usually consists of visiting one. I love a Pinto Gris, but "really" love Champagne! What a fun mosaic! We enjoy going to our local wineries and touring around the vineyards. My husband and I were at an outdoor event yesterday where wine was self-served from a box. It was over 90 degrees, so needless to say even the red wine was a bit warm! Ice cubes were the only thing that made it drinkable. I'm a dry white girl myself: chardonnays and pinot grigiots are my choices. Beautiful mosaic with a lovely blend of colors. Iced wine sounds good to me. I only knew the name of one I like, because I cook more with than drinking it, Silvaner made in Franken, Germany. I don't drink wine but love grapes and vineyards! Thanks for visiting me and commenting on my mosaic today. I like Chardonnay or Riesling, chilled, but no ice cube. Soft reds are okay. It's definitely about the journey! Love your vineyard mosaic. Occasionally we go to one in Central Florida. I like it because there are some hills and valleys there. I makes me feel like I'm in another state:) I tend to like whites better than reds and always prefer the slightly sweeter ones. lovely mosaic! What a beautiful place to visit. Your wine country mosaic is lovely. I live in wine country too and love summer and fall and the ripening of the grapes. Thanks so much for stopping by and for leaving your sweet comment.